It’s been a long while between posts as life built to a crescendo the past month or so, but I haven’t been sitting idle. I’ve actually made a new friend called Vine; a program which gives you six magical seconds of video footage. You can shoot 6 seconds straight or you can get into some tricky stop-motion animation. So my mind, of course, turned to football. 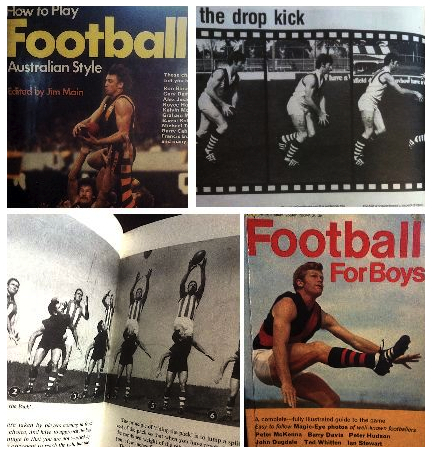 Below are some short video’s or ‘Vines’ I’ve compiled from some old football books, Football for Boys and How to Play Football Australian Style. Theses old books would demonstrate the skills of the game using a series of photographs displaying each skill. So I thought to myself…let’s animate it. Below are such heroes as EJ Whitten, Peter McKenna, Peter Bedford, John Dugdale and more, their still shots now brought to life. Please enjoy the following 18 seconds! For some reason the videos default to mute. You can hear the fairly unimpressive sound by hovering your mouse in the top left hand corner. This entry was posted in Musings, Yes we've got a VIDEO! and tagged afl, animation, Australian Football, Barry Davis, Carlton, Collingwood, EJ, EJ Whitten, essendon, Footy, John Dugdale, Melbourne, old school footy, Peter McKenna, stopmotion, Ted Whitten, vine by theholyboot. Bookmark the permalink. Ah, Holy Boot, you’ve done it again. This Vine stuff is like those ‘flicker’ books, when you draw an image in a corner of a page and change the image ever-so-slightly. Also, you mention that ‘life (has) built to a crescendo the past month’ – a new baby? Hi Vin, thanks again for your comments. Loved those flicker books, pity I never came across a footy one, if there were any. Not a new baby, just cramming in 5 uni subjects, 2 extra placements with 3 kids got the better of me for a bit there! All good now, 1 semester to go! Thanks for your concern.